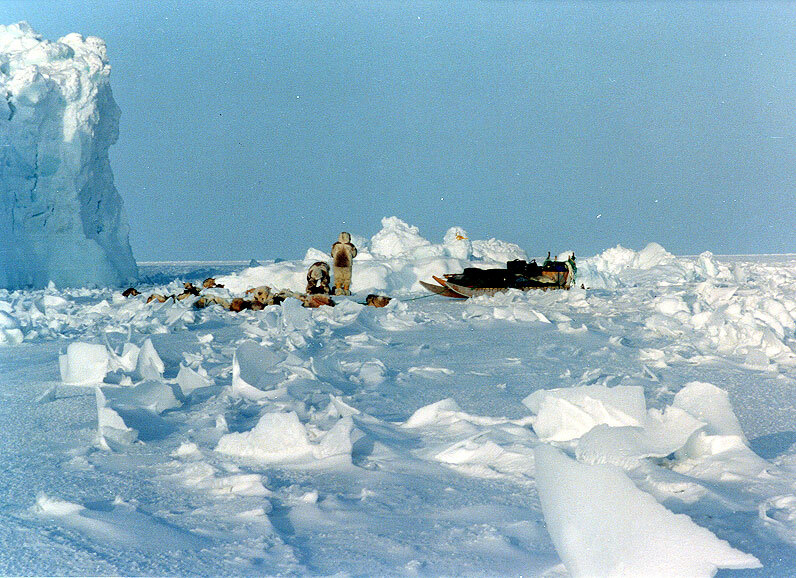 Note the Inuit traditional style sled, or komatik. When you live in a mountain town like Nelson, you get to see many adventure film documentaries. There is the annual ski movie, the annual mountain bike movie, the local films, and the traveling film shows, like my favorite, The best films of the Banff Mountain Film Festival. (Both Nelson and Yellowknife have been on the tour since the very beginning, which says something about the folks in both places I think – this might very well be a new and reliable marker for great communities to live in.) So I’ve seen many, and I’m always inspired. So inspired in fact that I come home every year from the BMFF on fire with a desire to see my own film up there on the big screen. After a few years of resisting that impulse, I decided to look at it differently. I probably don’t need to quit my job and spend 2 years learning how to be a documentary film maker, and I may never see my film in the best of BMFF, but I could buy a camera and make short, amateur films for fun. So this spring I bought a GoPro to get me started, just in time for Martin’s trip. (I kind of wish I was going along to document the whole adventure, although every night when I curl up in my cozy bed I’m quite happy to be there.) So I sent Martin off with strict instructions to take lots of photos and shoot some video and generally try to capture some of his experience on film. And I specifically told him to make sure he doesn’t forget the crying scene. The crying scene is an essential element of any epic adventure story. After months/years of planning/training/fundraising, the brave adventurer sets off, finally and joyfully underway. Eventually there arise the unforeseen and uncontrollable challenges that create additional difficulties, difficulties which usually require significant planning and detouring/delays in the journey, and that in fact may threaten the ultimate success of the venture. At some point, after days/months/years of backbreaking slogging in wind/rain/dust/cold/solitude/high altitude, battling adverse weather/distance/political boundaries/health conditions/financial destitution, our hero is worn beyond measure. This leads to the crying scene. This scene often involves Hero laying down by the side of the trail, or taking shelter from the vicious elements. Hero is interviewed by companion, up close and candidly. Hero is physically exhausted, thin, worn, dirty, often ill and emotionally fragile. Hero expresses the pain of the journey and the heartbreak of the realization that his vision may not be realized. Hero cries, openly or silently, according to personality. I wasn’t actually expecting Martin to film a crying scene. I know him better than that – at times of adversity he’s much more likely to get mad and to stomp around, and he might just throw the camera down some crevasse. I’m the crier in this family. So although he is not crying, t it seems like they have arrived at the crying scene part of their journey. They have come up against jumbled ice. 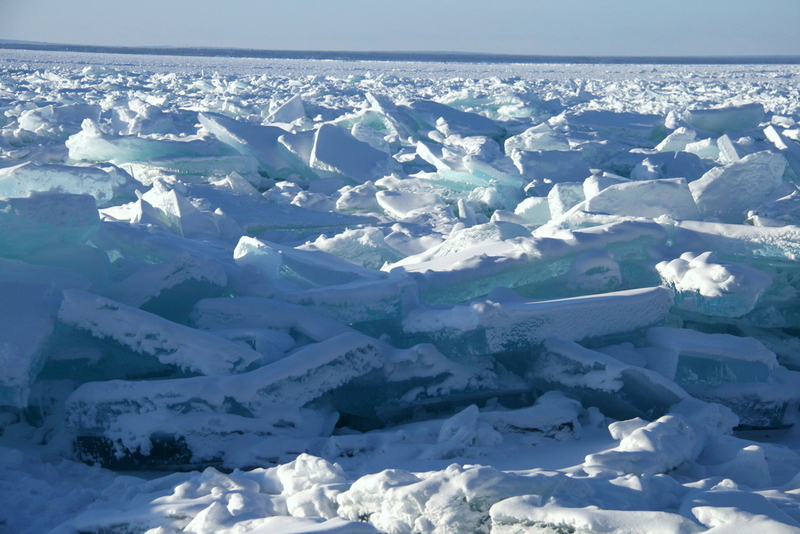 Max and Martin are on sea ice of course, which is also prone to jumble ice, and it can extend for 100s of miles. And they have been dealing with jumble ice for nearly the entire trip. Imagine trying to ski and route find and get a 14 foot sled through those conditions. Our friend Fred volunteered to take a few holiday days and fly from Yellowknife to Inuvik to drive the truck home, as the guys were planning a one way trip ending in Kugluktuk, which has no road access. (Apparently Fred is one of those people who think a 3000 km car ride is fun.) 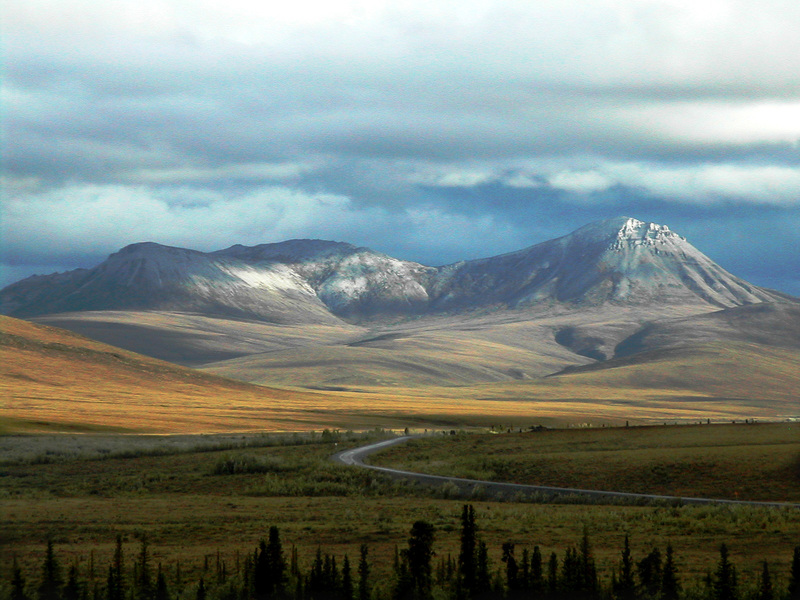 He saw it as a great opportunity to see the scenery, including the spectacular Dempster Highway. Digression: I too once drove the Dempster, for the view. Unfortunately it was in the middle of a forest fire so we saw not one thing. (We did get 5 flat tires, put 800 km on the lawnmower sized spare, stopped twice at the only service station or sliver of civilization on the 800 km road – what else, a tire repair shop – AND we even had two flats at once, which we managed to McGyver with a miniature toy bicycle pump long enough to limp our way off the Dempster, wobbling a little with the undersized spare). I think you get the idea – its rugged, even in the summer. Imagine it in the winter. Wait a minute – this sounds like good material for an adventure film too! 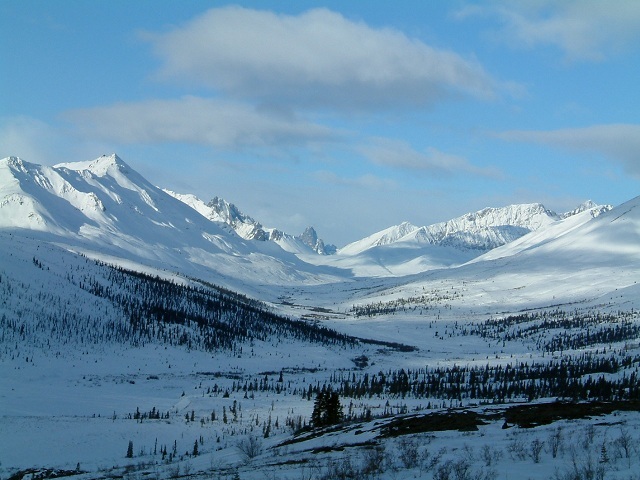 Tombstone Valley, along the Dempster. I have hiked here in the summer, and it’s spectacular. Operator: Your 60 seconds have expired. Please deposit another 25 cents. Operator: Your 60 seconds have expired. Please deposit 35 cents. Eventually, I was able to find out that the road from Inuvik to Eagle Plains had been closed for 3 days, and only opened for a few short hours, which was exactly when Fred wanted to get through. It was then closed again. Fred said the scenery was amazing though. So Fred continued on home with the truck. Until a few days later, when I got another text from his spot. So now the truck rests, its own crying scene finished, at the garage in Fort Simpson, awaiting the end of the Easter weekend and resumption of normal services. Fred is at home. The dogs are having a rest day. Martin and Max are no doubt eating dinner right now. They’ve had a good day too. This entry was posted in North of 60, travel and adventure and tagged Arctic, Canadian Arctic, Dempster Highway, documentary film making, Dogsled trip, extreme adventure, ice road, Inuvik, northern adventure, Northern Canada, sled dogs, The Arctic. Bookmark the permalink. Awesome Tandi! Sounds like the whole thing would have had me crying the whole time! LOVE this post, Tandi! Two adventures in one and so wonderfully told. I’m with Fred– I would totally have gone to Inuvik to drive the truck home (but would certainly not have been so able or cool-headed in blizzard/breakdown conditions.) And now I know why X-TREME TED didn’t get into the BFF: no crying scene. Safe passage to Max and Martin!! Oh, Lordy. But you certainly have the parameters of the film well-outlined, and I suspect you’ll have enough details to flesh out quite a plot once this all is …. uh….. sorted out. 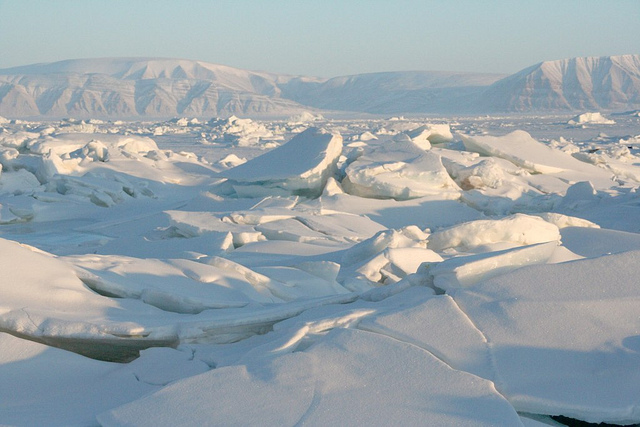 That jumble ice looks like the Arctic equivalent of the Great Dismal Swamp. It’s a danged good thing your explorers are intrepid, that’s all I’ve got to say. Now that the man is home, and I’m no longer fraught with anxiety for him, life is good. We are approaching spring – its actually quite warm some days, the ice is melting quickly and as soon as it fully melts, in about a week or so, we will be boating and the air will be much warmer. The transition happens so quickly. Right now there are birds starting to mate and nest in every bit of open water and how nice it is to have them back with us after a silent winter. Even the frogs in the marsh are singing. As are we. I hope spring in Texas is equally wonderful – although its probably hot there now. You have to be young, strong and crazy! What an adventure I caught cold just reading. Brave and intrepid travelers.